There is such a simple and easy procedure and common easily accessible products to remove scuffs and black heel marks when cleaning hard wood floors. This article’s goal is to provide our readers with information that will allow them to easily remove these marks from their floors while cleaning hard wood floors for a low inexpensive cost. Cleaning hard wood floors is relatively easy when using the correct tools and products but there are times when certain stains, marks and soils can be difficult to remove. Scuff and black heel marks can be a difficult to remove from a floor and many times trying harsh methods to removing these marks can actually damage the floor seal or coating. This type of damage causes a larger problem that usually cannot be corrected without preparing and reapplying the floor sealer or coating which is costly and time-consuming. We also must caution our visitors that if a scuff or black heel mark is so deep that it has penetrated into and through the protected top coating or sealer it would make the removal of these marks a difficult process and difficult. If the marks are this deep then they have most likely already have damaged the coating and a preparing and reapplying the floor sealer will be necessary to repair the top coating and remove the marks. With that said all surface scuff and black heel marks will be removed using the following products and can be performed as a part of cleaning hard wood floors during routine or regular cleaning intervals. That is right and Tennis Ball or Eraser Pad! These two items are inexpensive and something many homes already have in their houses. 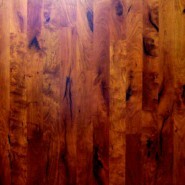 Always remember when cleaning wood floors; always use the least amount of water possible. Using a tennis ball, gently rub the scuff mark off the hard wood floor. Using a tennis ball gently rub the black heel mark off the hard wood floor. If the tennis ball does not remove the black heel mark try the following method. Use the “That’s Amazing” Cleaning Pad from Unichem Marketing or the Mr. Clean Magic Eraser from Proctor & Gamble and a touch of plain water; gently rub the black heel mark from the floor. The key in using these eraser type pads is to use them gently on sealed hard wood floors. So when cleaning hard wood floors from black heel marks rub softly and increase a slight amount of pressure if it is stubborn mark. The touch of plain water will assist in lubricating the pads.